Hi, I’m Geraldine, a 32 year old mum of two, wife of one and general threat to old women’s wardrobes. I am well known for being a bit of a dreamer. People sometimes call me fickle as I flirt with ideas of what I want to be if I eventually grow up, and I have an array of hobbies. I am a keen amateur photographer, crafter, dressmaker, wedding planner, florist, author, furniture restorer and recently I even dabbled in plumbing. I completely understand I must drive my friends and family nuts but I do stay true to one thing and that’s my greatest passion … my love for vintage. You can usually find me typing without thinking on either Facebook or Twitter. Otherwise I might be uploading my finds on Instagram, dancing around like a crazy lady to one of my favourite vinyls (on a vintage Dansette) or rooting about in a vintage shop. The Westwood Ho! Fair was the perfect event for me to cover, as I have a huge admiration for Dame Vivienne. Unfortunately I missed all the Westwood bargains as they were all snapped up, but I thoroughly enjoyed my day as Finder and really struggled to choose my favourites as, being true to myself, I loved everything. 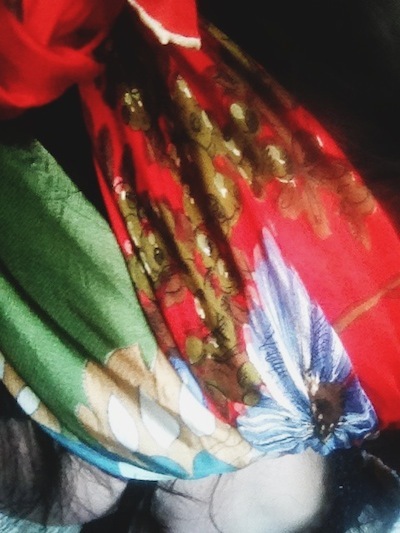 Can a girl ever have too many beautiful scarves? I think not, and to prove this I bought two Italian 100% silk scarves from the lovely lady at Kitsch Republic for just 50p each. My husband gave me a bemused look when I came home with more scarves to add to my already heaving collection and I don’t think he was entirely sure I was telling him the truth when I told him how much they were. 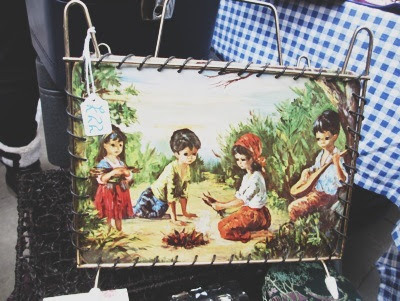 Maggie Mae's Vintage has to be one of my favourite stalls, there are just so many pretty things to look at and it's styled so beautifully, like it stepped out of a vintage photo shoot. 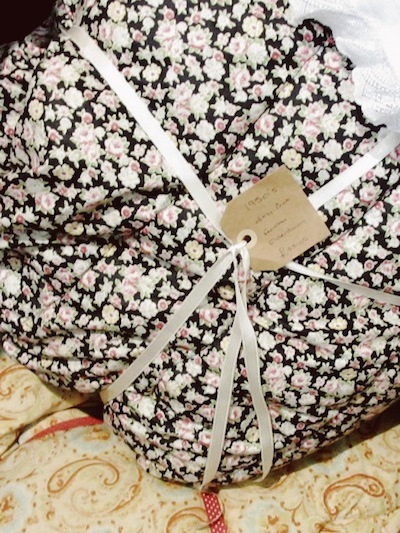 My favourite piece this time was a black ditsy print feather eiderdown for £55.00; it was so plump and full it instantly took me back to holidays at my granny’s snuggled up and drinking hot milk. I think this is the kind of piece that not only triggers your memories but that will keep on building them for everyone who has the pleasure to own it. 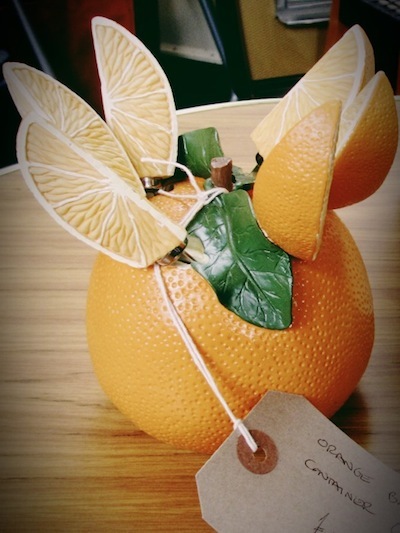 The night before the fair I was busy (as usual) looking at pretty things on the internet, when I came across a cocktail set shaped like an orange. It was so wrong it felt right, and that it should adorn my shelves. So believe me when I walked through the door of Room at the Top Vintage Goods and clocked a very similar but even better version at All Mod Cons I was both spooked and regretful. In perfect condition and still with its original packaging, this is such a kitsch cocktail party essential and at a cheaper price than the one I bought from Etsy. Lesson learnt. Okay, since were now almost friends, I feel its time I came out and admitted I have a problem. It's not easily dealt with. There's no meets for this kind of thing so I am just going to come out with it. I have a fetish for flasks. There is just something about a flask that I like. I find it magical that they keep hot drinks at the same temperature all day but it’s not that that draws me in. It is the patterns that adorn them: I like them bold, I like them checked, I like them with pictures but most of all I like them floral. So I was walking around the fair trying to avoid any such temptations when I came face to face with a display of flasks at Mint Vintage. 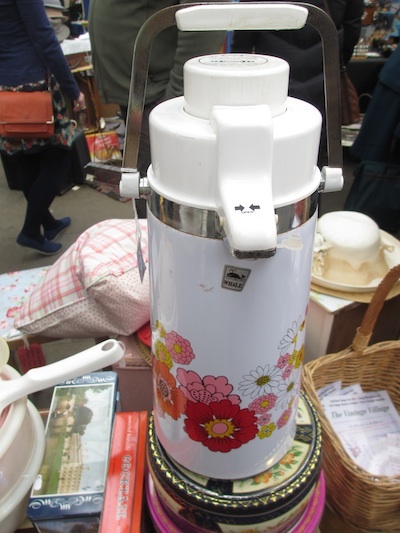 The stall holder explained that she too was harbouring a current lust (Flask Friends Anonymous works, right?) 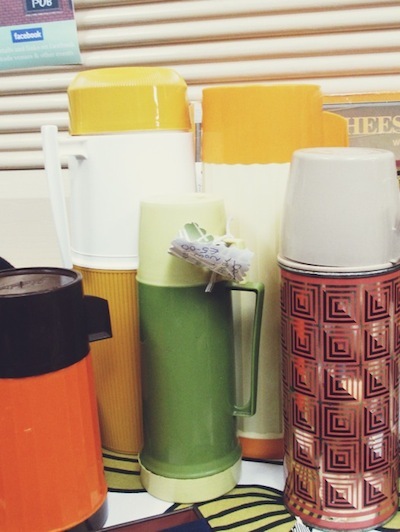 for a Thermos and had acquired some beauties ranging in price up to £10 for the gorgeous pink and silver retro design. I lingered probably a little too long and then moved on, silently congratulating myself on my strength of will, and walked right into the biggest test of my day at Time Bandit's stall . . . [see pic to the right]. I visited the fair with two lovely ladies, my mum Lynne and my mother-in-law Sandra, who both really seemed to enjoy reminiscing about their own finds. Sandra snapped up My Little Book from Violets for your Furs and will be taking it back to show her mum and dad on her next visit home to Newcastle. It was lovely to see how pleased she was with her little book and to hear her talk about reading it as a child. 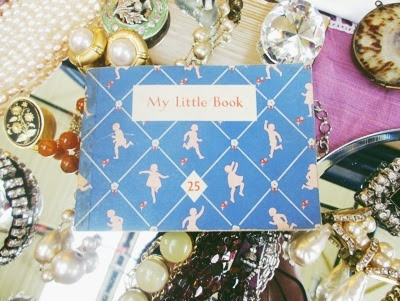 This is one of the reasons I love vintage so much; it’s the stories behind the items and the fact even a tiny little book can bring back feelings from as far back as learning to read. 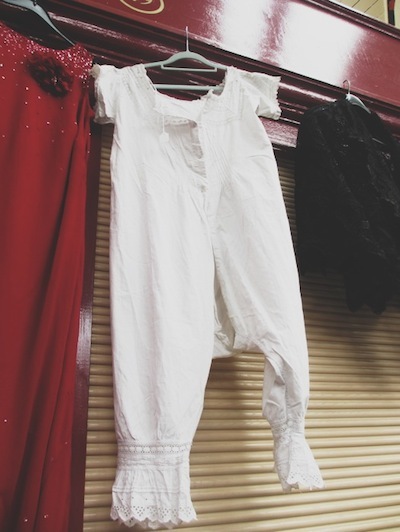 In a time when every teenager's Christmas list included a Onesie, I couldn’t resist a picture of this Victorian version, with beautiful Broderie Anglaise embroidery detailing. I can’t imagine this one doing the Tesco walk of shame any time soon. The stall was very busy and I couldn’t find out who ran it so I’m really sorry not to credit them, or the price [editor: we've found out! ], but I still wanted to mention it as it made me smile. Whenever I visit The Vintage Village, Snygg are always the stall that makes me wish I’d brought more money as their lamps are just to die for. 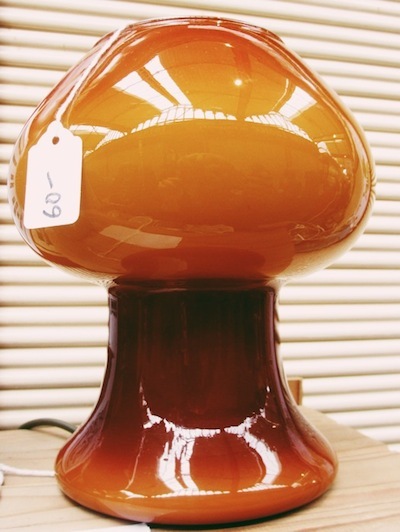 This time my favourite was this 1960s Italian Prova lamp which would look fantastic on the shelf in my living room. One day it, or one very much like it, will be mine. If you’re all still awake, I would just like to say a massive thank you to everyone that I managed to speak to, sorry to those I didn’t (or forgot to take a name), but as it was so busy I didn’t want to linger anywhere to long. Thanks for indulging me and I hope to see you again soon - maybe I’ll sit amongst you selling my own wares, plan your wedding, design you a dress or maybe fix your sink. [Editor back again] Huge thanks, Gez! We've really enjoyed your personal tour of highlights of the fair, it was such fun! P.S. I have a dripping tap. I wonder if you could take a look at it? 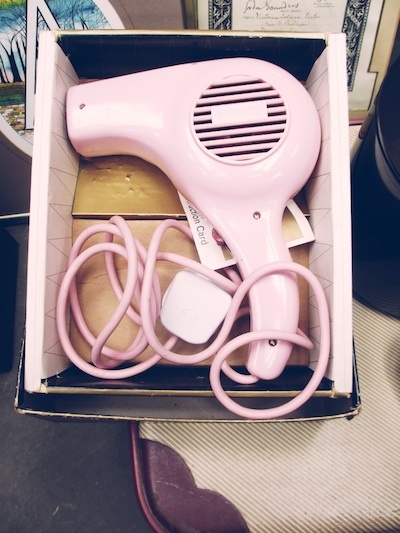 In the 1960s, when it was still okay to use pink to entice housewives, the Pifco Princess was a massive hit and on Sunday this working girl was all a-swoon over a pretty pink hairdryer. I found this retro piece still looking brand new and boxed. They say the early bird catches the worm but on Sunday one such bird with an eye for flower power missed out big time and is still kicking herself now. Emma of Oooh Betty! was just slipping a ‘Sold’ sign on it as I reached her quirky stall, but I couldn’t resist adding this little Mod overnighter to my finds. After checking with its lovely new owner, I snapped this shot which really shows off the psychedelic colours of the daisies that adorn it. I imagine this will be a statement piece in the lucky owner's home but I also hope it still gets used for trips away as you certainly wouldn’t miss it on the airport carousel! 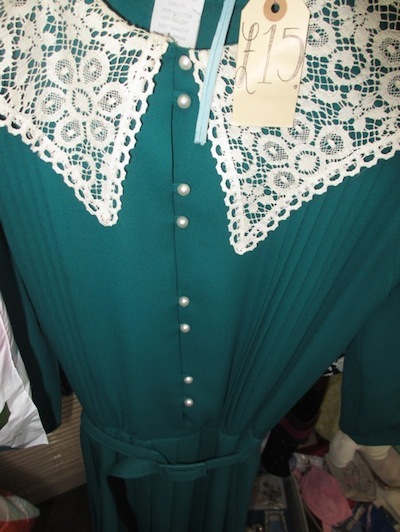 I have many green dresses, all nipped in at the waist and many with pleats, but I don’t have a green dress with pleats and a lace collar and now I really want one. I found this Berketex size 12 number on a rail at Lace and Liquor’s stall and I had every intention to go back for it but forgot to as the day passed so quickly. As I mentioned earlier I love photography and have a growing collection of vintage cameras so a visit to Make Do and Mend was a must. The gent who runs the stall is a delight. I’m really sorry I forgot to take his name, but we had a chat about his favourite photographers and he talked me through some of the interesting things he had for sale, including a Lomography Cosmic 35 in full working order for £20.00. 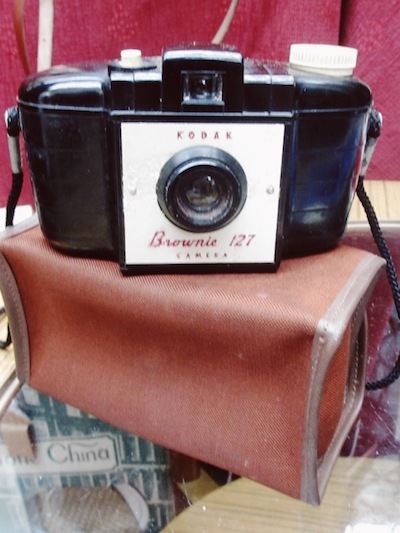 I bought a very cute Kodak Brownie 127, which was made in the mid 1950s in a black Bakelite plastic and has a rounded shape. It came in its original case and still had a leaflet with instructions on how to take a good photo. I think its days of taking photos are sadly over but I still love it. How fab would this early 60s magazine rack look in a retro lounge? It was made with a brass coated wire frame, with cord whipping around the edges and plastic feet. 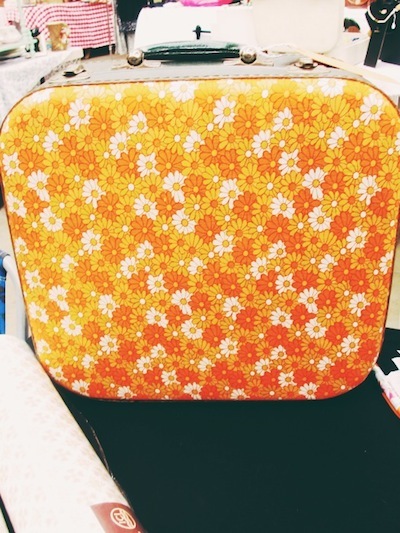 I guess some people may find it a little garish, but I think that’s what I like the most about it and it certainly stood out.
. . . where I found this late 60s Coffee Butler, which the owner remembered his mum taking on picnics when he was a kid. I walked away but have had the shakes since and will be on the lookout for it next time. Parrot in the Pantry deserves a shout out for its name alone, but I really had to mention them because I’m a huge advocate of up-cycling and these ladies are doing a fine job. 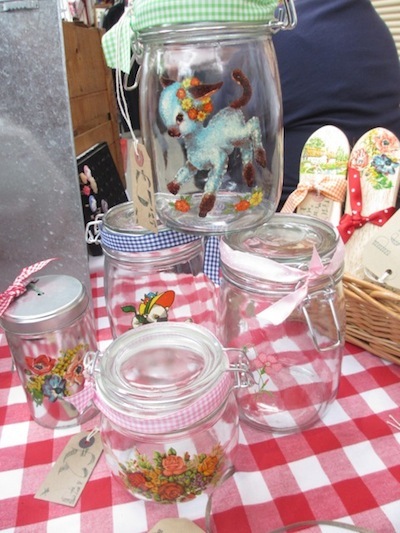 I bought some very sweet Kilner style jars on which they have delicately placed original transfers they have sourced from the 1950s and then decorated with ice cream coloured gingham ribbons. Who could resist a Little Fork? 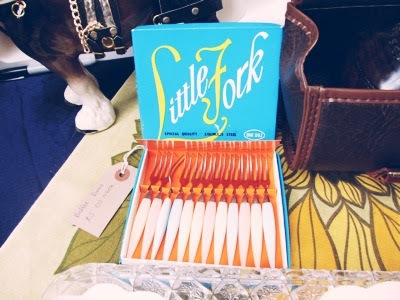 These 1960s pastel handled buffet forks were found on new stall Pearlie Queen Collectables. The packaging alone was worth the £3.00. As you can probably tell, I have a terrible sense of humour and immediately started to imagine a very trying 60s housewife fussing around her guests at a luncheon offering everyone a little fork and her naughty children sat giggling under the table. 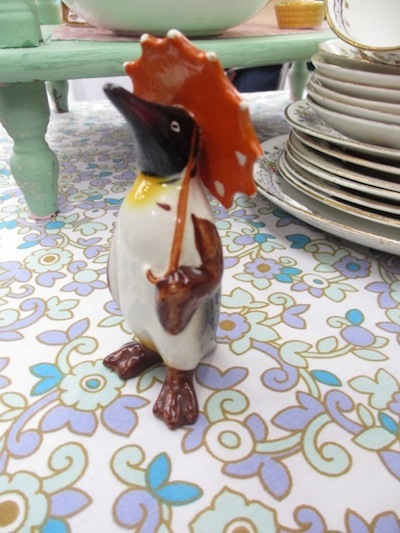 Meet Vivienne, she’s a Beswick penguin and she lost her partner sometime back so now she lives with me. I don’t usually go for pot animals, they're just not really my thing, but from the moment I saw her sat amongst the prettiest of tea sets at Tea for Two’s stall, I knew she was coming home with me. I remember as a child visiting relatives who had collections of Beswick animals and I just didn’t get it. I guess I still don’t (if you’re a pot animal collector and feel a little offended read back to the flask obsession, we all have our quirks). Vivienne will be my one-off pot love. I also bought a milk jug for £3.00 from this stall and will definitely be back to visit them as I had my eye on a retro mirror picture with a couple kissing, which you can see on my Instagram account.